The Irish FA is set to go to the Court of Arbitration for Sport in an attempt to prevent more Northern Ireland-born players opting for the Republic. 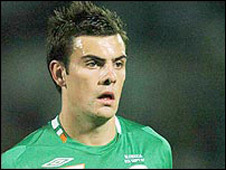 The IFA move follows Everton player Shane Duffy's decision to declare for the Republic earlier this week. Duffy had played for Northern Ireland up to Under-21 level and was included in the full squad last year. Manchester United's Darron Gibson and Portsmouth's Marc Wilson have also switched allegiance in recent years. Duffy's case differs from those of Gibson and Wilson in that the Everton player does have a parent or grandparent who was born in the Republic of Ireland. The IFA acknowledges that under existing rules, Duffy is eligible to play for the Republic of Ireland. However, the Northern Ireland governing body will argue that players such as Gibson, whose parents and grandparents were born in Northern Ireland, should not be allowed to declare for the Republic. There are fears within the IFA that the player drain to the Republic could gather increasing speed. The decision to take a case to the Lausanne-based Court of Arbitration for Sport (CAS) was take at an IFA board meeting on Thursday evening. An IFA statement acknowledged that the move was "an unusual step". "The Association is keen to stress that it does not take this course of action lightly but in light of recent events and potential future issues, it believes it has no other choice regarding the resolution of player eligibility," added the statement. "The current situation that exists puts the IFA at a clear disadvantage against all other 206 associations. "The Association has worked hard on its 'football for all' programme being at the heart of everything we do and we spend a substantial amount of money on grassroots and youth international programmes and this must be protected for the good of football in NI." The IFA has been at loggerheads in recent years with the Republic's governing body, the Football Association of Ireland (FAI), over the issue. The Northern Ireland governing body was hopeful that the issue would be resolved at a Fifa meeting in December 2007 but that international gathering failed to clarify the issue. At that time, Fifa spokesman Andreas Herren told BBC Sport:"If there is a real dispute...they will have to submit it to the Court of Arbitration." More than two years on, the IFA is now set to go down that road although the FAI remains confident that the CAS will not change the current position.